Celebrity Blackjack was a TV show aired on Game Show Network (2004-2005) where Hollywood celebs and blackjack players played tournament blackjack card game for charity. Matt Vasgersian, sport commentator and popular TV personality, hosted the show (accompanied by Alex Borstein during the first season). Bad Boy of Blackjack - great and terrible Hollywood Dave Stann performed the role of a dealer. 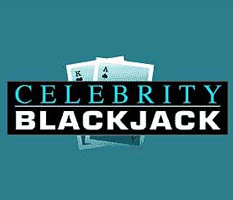 Celebrity Blackjack 1st Season was aired once a week (July 5 up to August 10, 2004) and the 2nd Season was premiered on October 12, 2005 and aired up to January 11, 2005. The shoe included jokers; the player with a joker could switch it for any seen unplayed card on the playing table. 5 card charlie rule presence (a player who has a 5-card hand and doesn't go bust - win automatically). 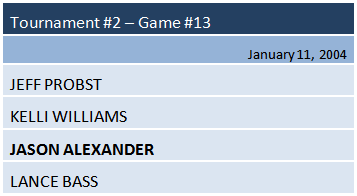 Now let's go over to the Celebrity blackjack tournament guide and consider the each game information - the air date, the participant staff and the winner name.